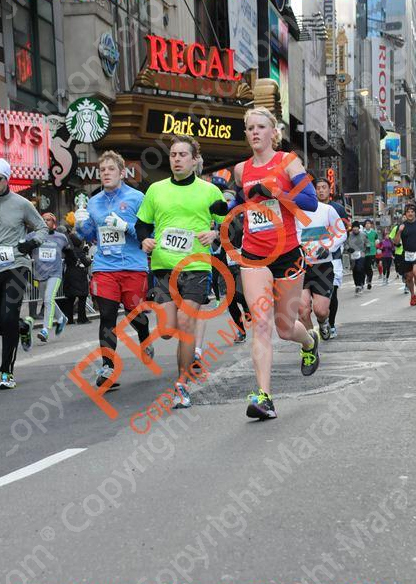 If I learned anything from the NYC Half this year, it’s BRING THROWAWAY PANTS. 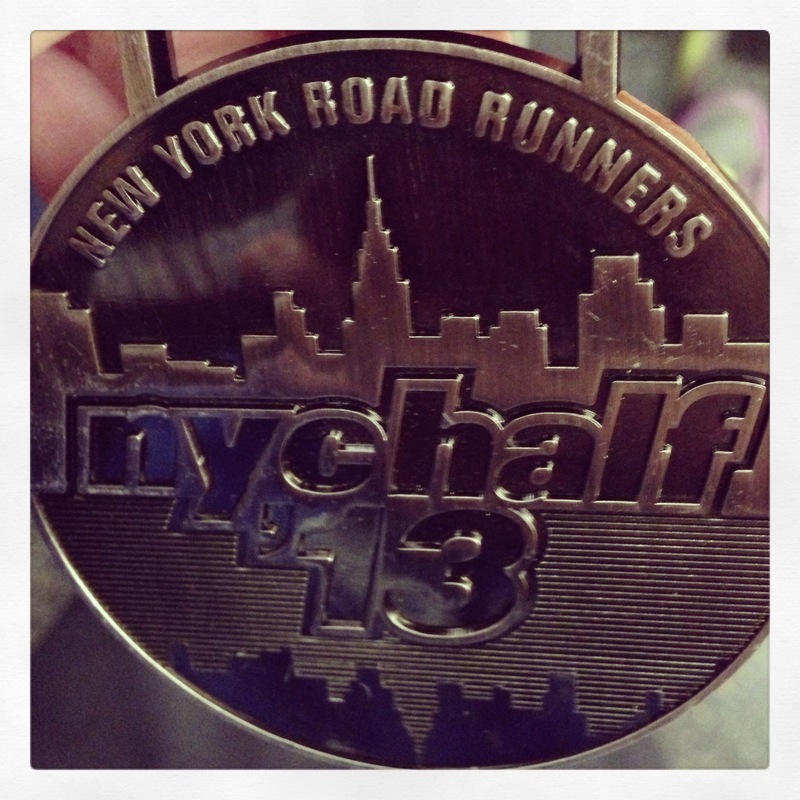 Also, I think I’m in love with half-marathons… Yep, I definitely love ’em. Like last year, I went into this race with the goal of running by feel. If I felt good, I’d go with the flow and race it. If not, no biggie. It’s only a training run for Boston to Big Sur. Well, it’s hard not to get jazzed up when you’re surrounded by over 20,000 other runners in Central Park on a chilly March morning, especially when you get a surpise boost of encouragement from twitter friends! (Thank you Jocelyn, Corey, and Mary!) And God knows I’m not able to relax during the first few miles of a race. Gotta go guns blazing, right? After freezing my buns off for half an hour before the race (re: throwaway pants are essential), off we went, heading north up the east side of the park. The gradual inclines warmed me up pretty quick (thank goodness), so I settled into a comfortable but quick pace. At the top of the park, we ran a hairpin turn before heading into the Harlem hills. Personally, I love hairpin turns. Marine Corps had one, too. I get SO pumped up being able to “watch” the race for a bit and keep an eye out for familiar faces. I spotted elite runner Desi Davila Linden and Corey again, which was so happy on so many levels. The energy among the runners and spectators was electric. After the biggest hill at the top of the park, the next two to three miles brought more rolling hills before we exited onto 7th Avenue. I’ll admit, I started to regret pushing it so hard in the park. The hills wore me out. But like last year, the epic, towering view down 7th Avenue was just incredible. It’s literally so breathtaking and awe-inspiring that you can’t really wrap your brain around the fact that you’re running down the center of one of the most famous streets in the world. And you don’t even have to dodge tourists. It goes without saying my pace quickened quite a bit at this point of the race. Halfway down 7th, a band started playing YMCA. If you read my blog, you’ll know that the same song played during the Boston Marathon last year. It’s one of my favorite happy memories from that otherwise awful day, so hearing it again at this race left me brimming with emotions, some good and some bad. April 21 is going to be full of moments like this one, I know it. A brief turn toward the Hudson River brought us to the Westside Highway. At this point, there’s just over five miles to go, and they’re all flat as a pancake. Still high off my jaunt through Times Square, I found a rhythm running around 6:45ish pace. I still, surprisingly, felt comfortable and in control. This is why I love half-marathons. I felt like I was actually racing rather than surviving. 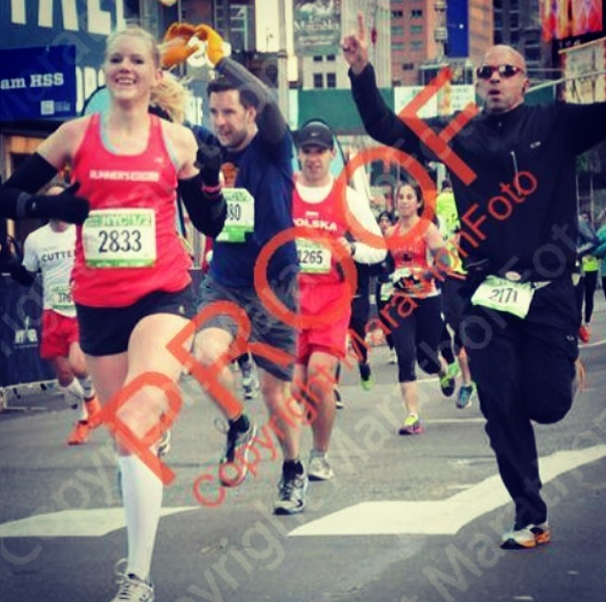 And since 13.1 miles seems short now compared to a marathon, I wasn’t afraid to push the gas pedal a little more. I kept ticking off the miles, soaking in views of the Statue of Liberty, then running in the shadow of the now-complete Freedom Tower before deciding to gun it the last two miles. At this point, I knew a sub-1:30 was just out of reach, but I was primed to run a PR. A final push through the finish clocked me in at 1:31:05, an almost 2 minute, 30 second PR. Talk about the runner’s high. The whole race was one long hit of the runner’s high. To top it all off, I ran into an old teammate of mine from Lehigh AND Jenny from Hood to Coast, who had also just crushed her race with a sparkly new PR. So much happiness! Yes. Exactly. All of those miserable, slushy miles were worth it. The game plan for this race was to feel out the first few miles and go from there–if I felt good, I’d try to race it; if not, I’d settle in and enjoy the ride. Deep down I wanted to shoot for a PR. My fastest half is my first one I ran in Philadelphia in 2011. It was just after my cross country season ended, and my fitness from that got me a 1:35:01 finish time. I remember running a few sub-7:00 miles, and I wasn’t sure if I was at that level now. Regardless, nabbing a PR was on my radar. Why not go for it if the opportunity presented itself, right? Sure enough, I actually felt pretty good. Despite having to weave through crowds for the first three miles, I easily hit 7:10ish pace, running through the 5K in 21:59. Central Park was absolutely stunning that early in the morning, which kept me happy and distracted. At this point, I decided to see if I could hold that pace for as long as I could. Once we finished a full six-mile loop through the park, we turned onto 7th Avenue. And holy wow was it breathtaking. The entire road was closed off for almost a mile, and I got chills taking in the view while I ran in the middle of the street between the towering buildings toward Times Square. For me, Times Square means insane chaos in the form of distracted masses of tourists and speeding taxi cabs. But this morning, the road was ours and the usual blaring NYC soundtrack was replaced with screaming spectators. I even got an unexpected shout-out from a friend on the sidelines! Needless to say, my pace picked up a bit, and I ran the fastest mile of the race. The course then turned toward the Hudson River for a miles-worth of freezing headwinds before we started miles eight through 13 on the Westside Highway. This was my least favorite part of the course, but I was excited to still be (somewhat comfortably) hitting around 7:10 pace. The PR was becoming more and more of a possibility, so I turned my focus toward maintaining my pace for as long as I could. Around mile nine, I gave myself a recovery mile and eased up a bit because that speedy 7th Avenue mile was coming back to bite me in the a**. Thankfully, the slower mile paid off, and I was able to drop it back down to the low 7s at mile 10. Along the way, I caught a glimpse of the Statue of Liberty in the distance–how cool?! ?–and we ran right beside the new Trade Center, which was a humbling experience to say the least. When we reached mile 11, I did the math and figured out that I would be right at my PR if I ran 8-minute pace for the final 2.1 miles. I was still miraculously cruising along at 7:10 pace. A PR was definitely within reach. Talk about an awesome feeling. I pushed the pace a much as I could for the final meters of the race and crossed the line in 1:33:31. I PR’d by exactly a minute and a half. 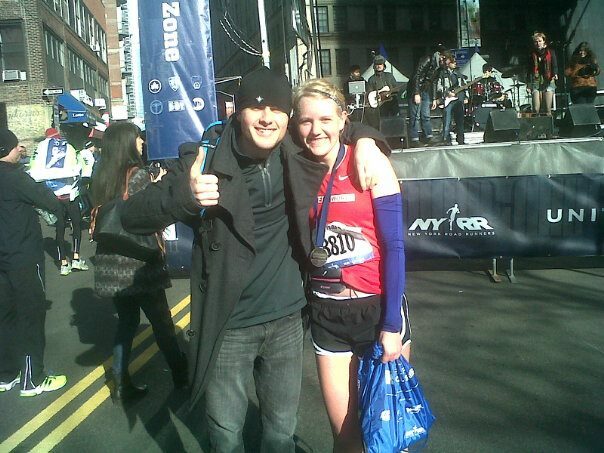 Post-race with the ever-incredible Kyle who graciously lugged my gear from the start to the finish. Thank you! After the race, I spoke with my mom, and she pointed out that I was still able to have a great race despite not doing my usual, super-OCD pre-race routine. She reminded me of how in high school and college I used to get so anxious literally days before a race. I’d waste far too much energy on my nerves, and I’d freak out if I didn’t get in the proper warmup or eat the right thing. But today, all of that went out the window. I went into it with a “just get out, have fun and race if it feels right” attitude. I ended up snagging my first PR in over a year. Though I certainly don’t intend to repeat what I did yesterday, it’s nice to know that I can still race well even if some curveball gets thrown my way. Once again, I learned that having the right atitude about a race–especially in the final few days beforehand–plays SUCH a big role in its outcome. (This should be obvious, but as we all know, it’s an incredibly frustrating and hard lesson to learn.) Once the race starts, just focus on running. Go with how you feel at that moment, not how you think you should feel. (So what if I only got three hours of sleep? I actually felt smooth and fast!) Don’t sweat the small hiccups that you’ll inevitably experience because they’ll just weigh you down. Overall, I’m SO happy I decided to run. 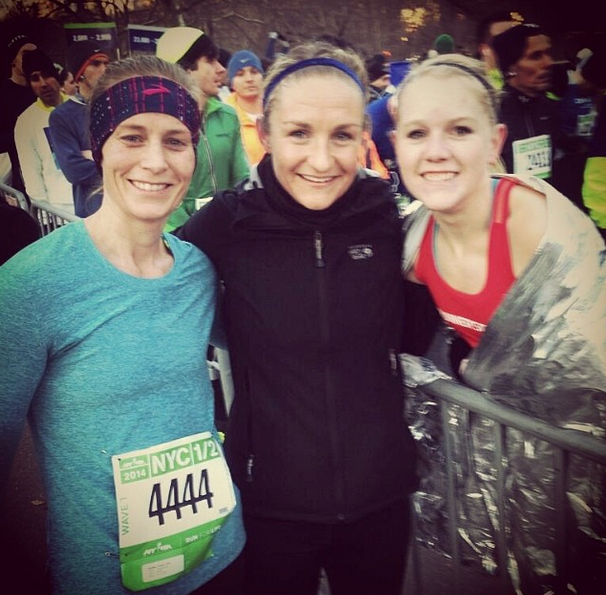 The NYC Half is definitely in my top three road races I’ve ever done, and I’d highly recommend running it someday. Yesterday I realized that I’m in as good as, if not better, shape than I was in college. Now I’m even more pumped for Boston! Just 27 more days people! 27 DAYS!